WOW! I didn't know how popular this recipe would be until I posted it on Facebook and Vegan Amino! 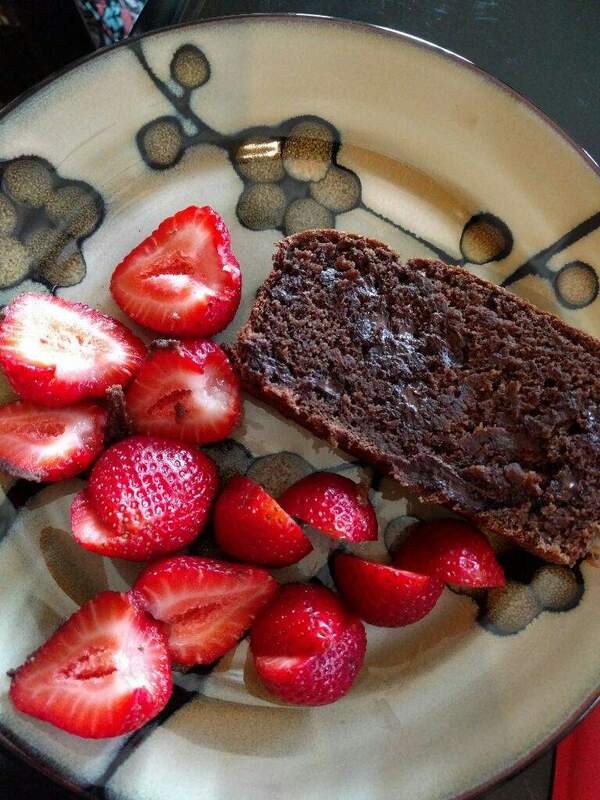 I guess an oil-free yet tasty banana bread (with chocolate!) is enticing to most people. It makes you feel LESS guilty. :-) I do admit that this moist and dense bread is the perfect occasional dessert. It's not too sweet, but just the right sweetness. It's also just the right amount of chocolate to curb a chocolate craving. Paired with berries, it's absolutely marvelous! In a blender, combine the bananas, applesauce, non-dairy milk, and vanilla. Blend until smooth. In a large bowl, whisk the flour, baking soda, salt, cocoa powder, and coconut sugar together well. Add in the banana mixture and stir to combine. Do not overmix. Pour into a standard-size, non-stick loaf pan. Bake for 45 minutes and insert a toothpick in the center to make sure the bread is done. If the toothpick comes out clean, remove from the oven and let cool a bit before serving. If the bread is not done, continue baking and checking every 5 minutes or so. People said there is a smiley face in my banana bread! ;-) See it??? Perfect timing! Just popped it in the oven. Cannot wait to enjoy with the family. Mrs. V...Please let me know if you liked it! Post a pic on my Mrs. Plant Facebook page! How did you banana bread come out? Did you like it? My family scarfed it down in an hour! It was WONDERFUL! Even my skeptic husband thought it was amazing! We had it after dinner last night and I finished it off for breakfast : ) I'm going to try your Oat Cheese next! Thank you so, so much for these recipes!! So glad you enjoyed it, Sarah. Let me know how you like the Oat Cheese. Warm it just before you serve for best results! I made this the other day, and it is SO GOOD! I've been checking out some of your other recipes and I can't wait to try some of them!! I love that you create oil free whole food vegan recipes. Thank you! I made this yesterday and it is AMAZING! My husband also licked it :) Do you think these could be done as individual cupcakes?